Flexibility is key to our unique design. Redfas shelves come in a variety of sizes and configurations and have been designed to be expandable. The open wire construction of Redfas shelving allows increased light and sprinkler penetration, free air circulation, and high product visibility. Don’t worry about time-consuming assembly – our assembly couldn’t be easier! No tools are required for setup or adjustment. You can count on strength and reliability with Redfas shelving. 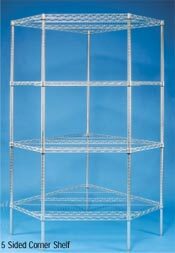 When evenly loaded, each wire shelf that is 48” or less can hold up to 800 lbs. Larger shelves can hold up to 600 lbs. of static load. Our SilverSeal Shelving line has been designed to meet the demanding storage requirements of both dry and wet environments. 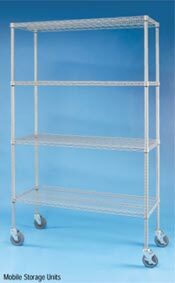 The high-quality wire shelving is backed by a 10-year warranty against rust and corrosion. All products shown come in a variety of sizes and finishes. Shelves range in width from 14” to 36” and in length from 24” to 72”. PLEASE CONTACT OUR SALES DEPARTMENT TO OBTAIN A DETAILED LIST OF SILVERSEAL PRODUCTS, SIZES AND SPECIFICATIONS. 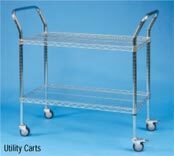 Manufacturers of Steel Wire Products • Wire Shelves • Display Fixtures • POP ©copyright 2002 Redfas Industries Inc.